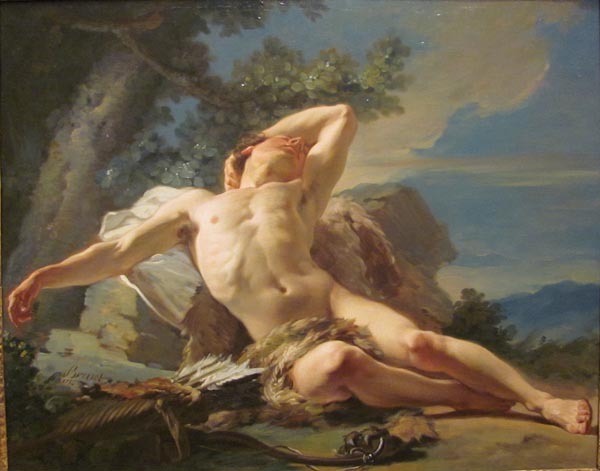 In the 1700s, it was a common practice to give an academic figure study a mythological twist. For example, this 1756 painting by Nicolas-Guy Brenet isn't just any reclining figure. It's "Sleeping Endymion." Endymion was a shepherd who had attracted the loving attention of the moon goddess Selene. She caused him to fall into an eternal sleep (with his eyes open) to preserve his beauty and youth. She would then be able to visit him every night. Here's a similar pose but a different mythological setting. The painting, by Jean-Bernard Restout (1736-1796), is called either "Somnus," "Morpheus," or "Hypnos." 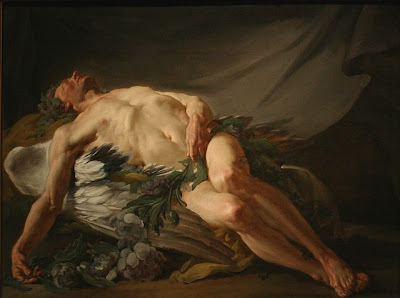 Hypnos is the god of sleep or resides in a cave of eternal darkness. He is often shown with wings coming from his head, but here he looks more like an angel resting against his wings. Adding these mythological layers can seem extraneous or gratuitous if the story doesn't guide the entire conception from the start. But when it's done thoughtfully, it offers both the artist and the viewer many new layers of feeling and association. The problem for artists these days is that the audience is generally not familiar with the stories and the characters of the Greek and Roman mythology or of the Bible. An artist can count on everyone knowing what a cupid or a mermaid is, but viewers might not be as familiar with characters such as Sisyphus. Despite Hollywood's recent attempts to popularize mythic stories, the characters most people recognize tend to be comic book superheroes, which are trademarked and owned by big corporations. Wouldn't an artist still be able to portray a copyrighted character from comics or cartoons for a work of fine art to sell without worrying about being sued by the owner? I'm not entirely certain of the laws about this. Or if an illustrator is selling a limited number of prints it seems to be something that owners of a character either let slide or possibly can't sue for. Maybe an example of Dave Rapoza's TMNT posters could be applied here. Jeff, it's a good question, and I'm not sure of the exact legalities on painting trademarked characters. Maybe others can shed some light on this one. I see a lot of fan art of TV characters for sale at con art shows. There must be some kind of loophole. In a way though, I like having reference to mythology or literature that only a few will get. It adds an extra bit of fun to a picture. I named a water lily picture "Withywindle Lilies" and even if no one ever gets the reference, it makes me smile every time I think of it. It's a topic I've heard discussed many times. Typically no one sues over it ... but they could if they really wanted to. It all falls under the Copyright Act, which also makes allowances for parody, usage (commercial or educational) and a bunch of other murky and ill-defined factors. Comic book publishers appreciate the publicity and interest generated by fan artists, so as long as you're not making a lot of money by mass-producing the work (for example, on t-shirts) then they let it slide and even encourage it. It does seem like a strange gray area. I can think of several artists that have used an altered version of Mickey Mouse in their paintings. Perhaps it's a case of if Disney wanted to sue them it would gain even more attention for the artist, something they probably don't want and that's why they let it slide. every mouse character then be seen as a more or less derivated version of Mickey Mouse? Can the cat Sylvester be seen as an alternated version of Tom (legally, that is)? Where would you suggest beginning to get inspiration and what other pieces of advice could you get given an aspiring painter who would like to paint more realistically like you do as well as the Masters of the past example Cervantes, Rembrandt ect. I love your blend of realism and fantasy by the way and your style is amazing. I recently took of field sketchin ad watercolor painting en plen air like yourself. Shogunru --- basically I'd say to sketch a lot, read a lot, copy old masters, and draw from your imagination. If you develop a hunger and a regular practice for all those things, you'll go far. I think it will be a great addition to already existent art related links you put on your blog. Thanks, Laurenţiu -- I added it it under Painters and Painting. You're right, it's a great resource.